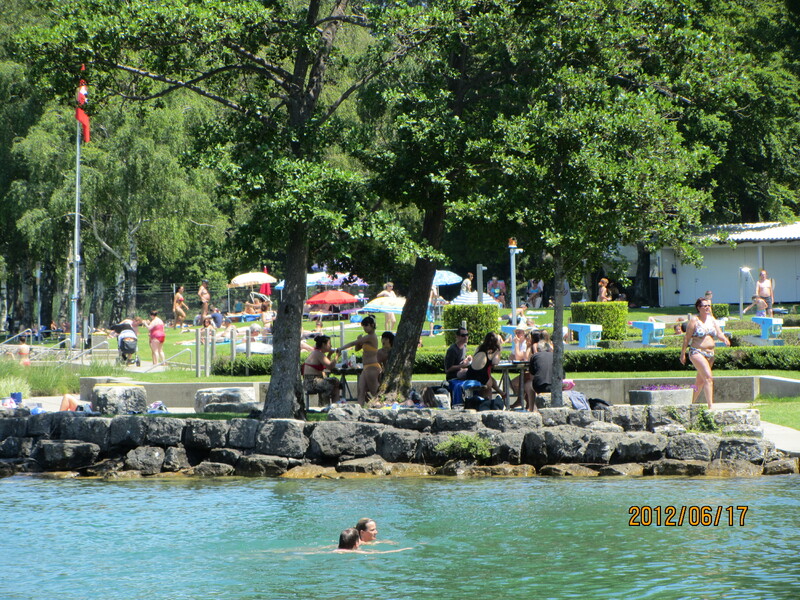 You don’t expect Switzerland to have a summer-resort aspect to it, but it does. We could bring a box of sand back as a souvenir instead of skis, but then no one would really believe it was from Switzerland, the land of snowy alps. After today, we fall into the single-digit portion of our Countdown to Canada, leading me to go into a little bit of a souvenir panic. 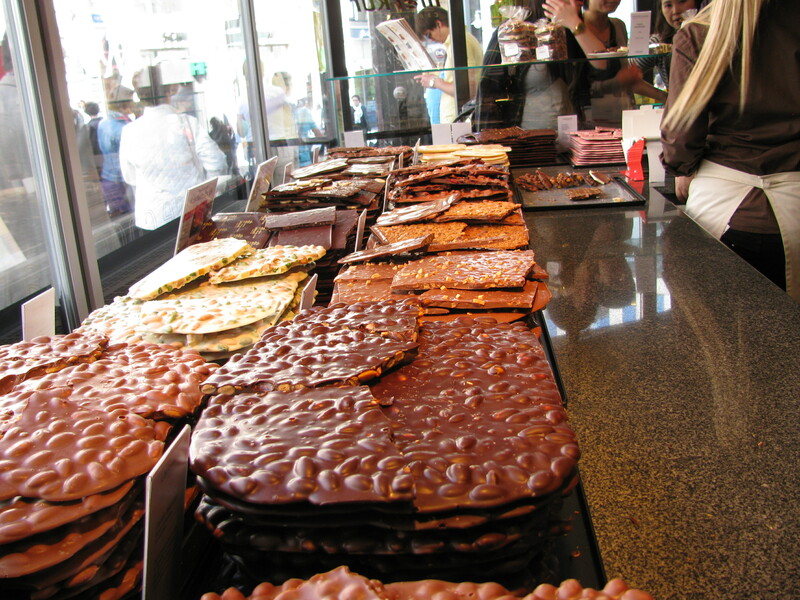 Our conundrum is this: We want to bring something back that is distinctly Swiss, however, this desire competes with our goal to pack as lightly as possible. We have found a pair of old wooden cross-country skis at a nearby second-hand shop. 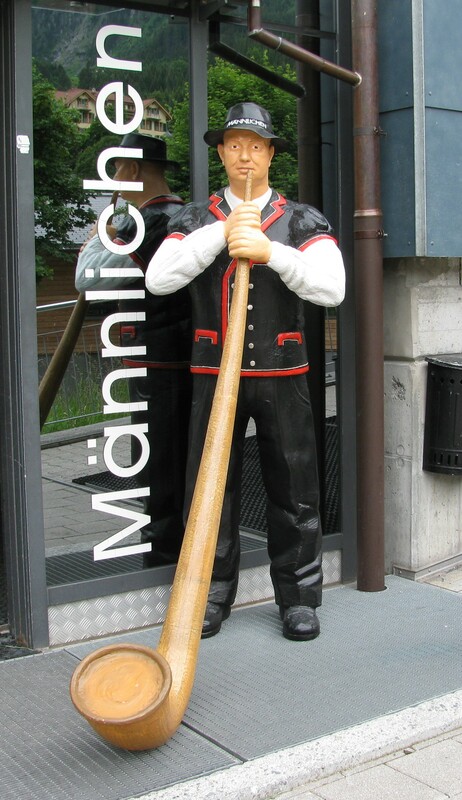 They were made in Nidau – a town just beyond the train tracks. The skis have been a subject of discussion since we saw them (I’ve written about them already – click here to see it), and we visit them often. At one point, they disappeared from the shop and Dave breathed a sigh of relief that the question had been resolved for us, but then we found them stuffed away in a corner. There are multiple problems with shipping the skis, beginning with the requirement that if they go on the flight with us, they must be packed in a molded-shell ski case. Of course, molded ski cases are modern devices made for modern skis. These skis are ancient and very long. 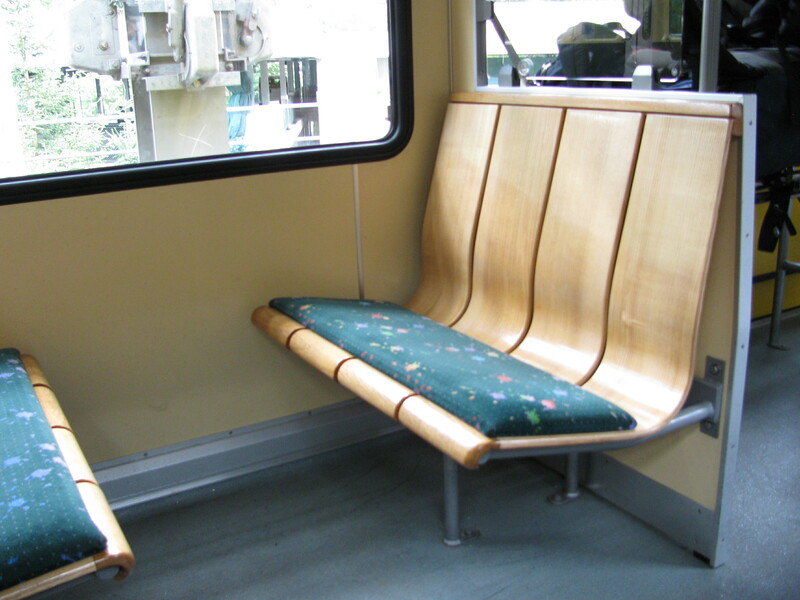 They are also very heavy, so mailing them could cost upwards of 500 Swiss Francs (CHF)*. Our frugal natures flinch at such an extravagance. And this potential 500 CHF tab is before Switzerland’s export office opens the package and sees we are trying to make off with some of Switzerland’s precious lumber, albeit very old lumber. So we seesaw endlessly over the question. In the meantime, I’m going to visit the skis again and see if the shopkeeper speaks enough English to field a question about overseas shipping. Note: I know 500 CHF sounds like an over-estimate, but when I looked into shipping back a double-shoebox-sized package of books, the estimate came in around 450 CHF. I cannot even breathe when I contemplate the cost for a pair of skis. These wood skiis in a Biel/Bienne secondhand store were made in Nidau - a town within walking distance of our hotel. Souvenir bells, spoons, caps, key chains: They remind us more of factories than they do of any place we’ve visited and so we’ve always kept an eye out for the slightly offbeat homegrown item when we’ve been on these 1-2-year work excursions, beginning in 1985. Then we returned from an 18-month posting in Thunder Bay with a baby boy. This makes him an anchor of sorts to our memory of when we were there. Any time we forget the year, we have only to ask him his age. Not everyone will agree this makes him a souvenir, especially not his wife, but there it is. 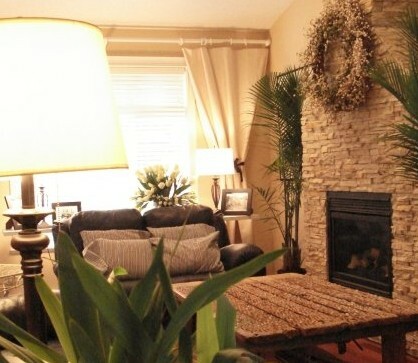 We tend to favor geological souvenirs – stones of all sorts and sizes. We packed back a didgeridoo or diggery doo from Australia, a stone-flint-pocked threshing sledge from Spain that we converted into a coffee table, and from Atlanta, we brought back an enduring addiction to Honey Baked Hams, Krispy Kreme donuts and homemade ice cream. The addiction is as palpable as the threshing sledge and the diggery doo. Some months ago, we discovered a pair of ancient wood cross-country skis that were made in Nidau – the town that adjoins Biel/Bienne. Skis seem the perfect thing to bring back from the land known for its Alps and rugged mountaineering traits, but the hiccup is that without a car, we would have to carry the things on the train, not to mention through Zürich’s vast airport. The weight of these skis is shocking to us – and they also explain how it is the Swiss are so robust that they think nothing of clambering up cliffs and traversing endless miles by foot or bike. Ten minutes a day on these skis over a period of six weeks would give anyone Herculean strength. But the question is whether we the withering have the power to carry them several city blocks along with the rest of our luggage. In the meantime, we visit them on weekends to seesaw our way through the debate to buy them or not. Spanish threshing sled turned coffee table at our Victoria house. 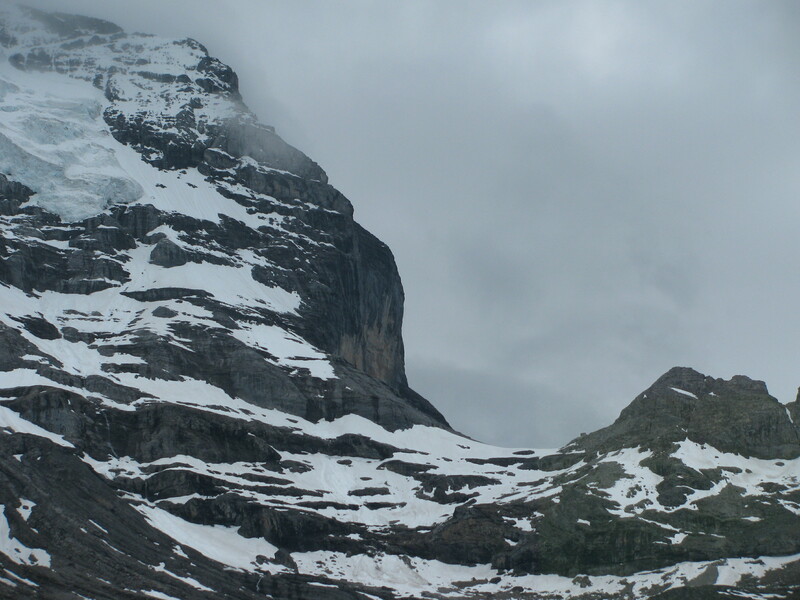 Rain fell overnight, much to the delight of the Swiss who are enduring a drought that has not only parched its creeks and waterways but also left its famous skiing regions bereft of snow. 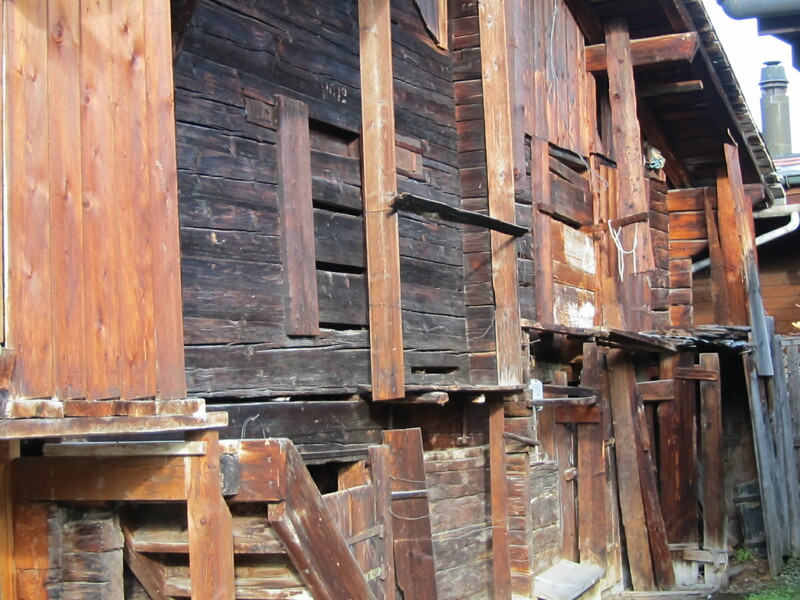 Meanwhile, in our little town the streets are filling up with wooden cabins of varying styles, going from slapped-together plywood shacks to fanciful cottages of beadboard walls and gingerbread trim, and then to the grand stuff: A heavily-timbered log cabin. Yes, a real log cabin. All this is in preparation for Biel/Bienne’s Christmas Market, which promises to be a fabulous one, but it does not open until next weekend and so later today we’ll head to Zürich where there are not one but two Christmas Markets, plus what has been promised to be a fabulous light display. I’ll post those pictures later. 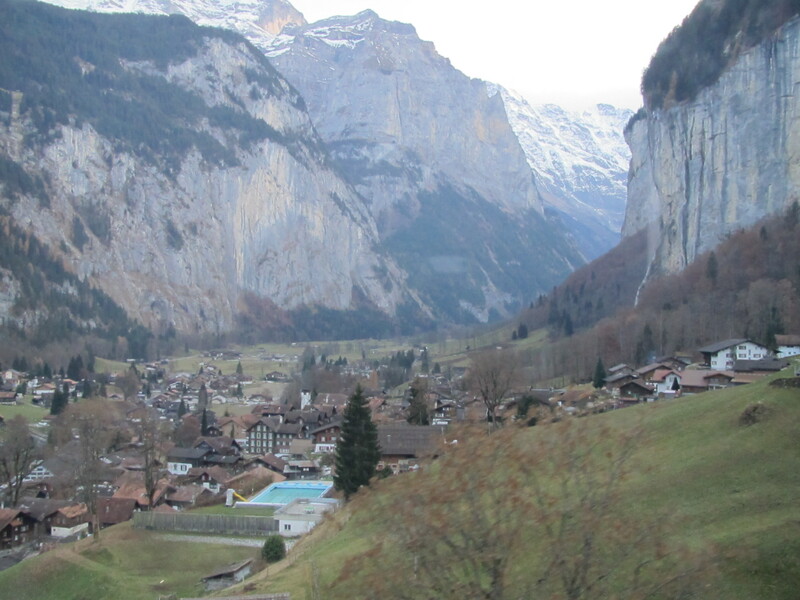 This was our second time strolling through the village of Murren. It was almost December and we expected snow, but saw none but that which topped the mountains. The ski hills are reported to be dry, choking the Swiss economy which is already battling the woes of having a strong currency in a weak market. 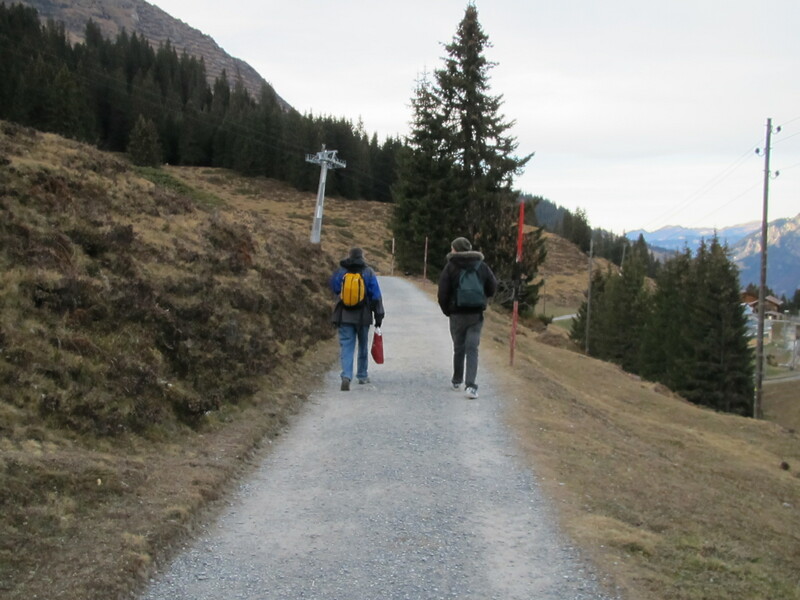 You can access Murren on either side by gondola and a cute little train ride, but you can also walk between either access points. 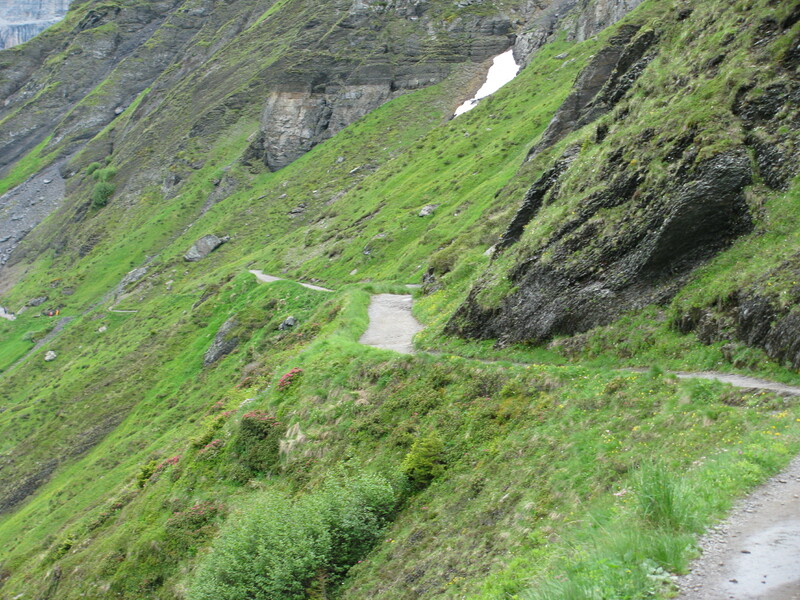 This is the trail between Murren and the Lauterbrunnen gondola station. It is an easy walk with only mild grades and goes through some forest that looks a lot like Vancouver Island's Galloping Goose. A motorized wheelchair could make this trip with just a little help over some rough patches. 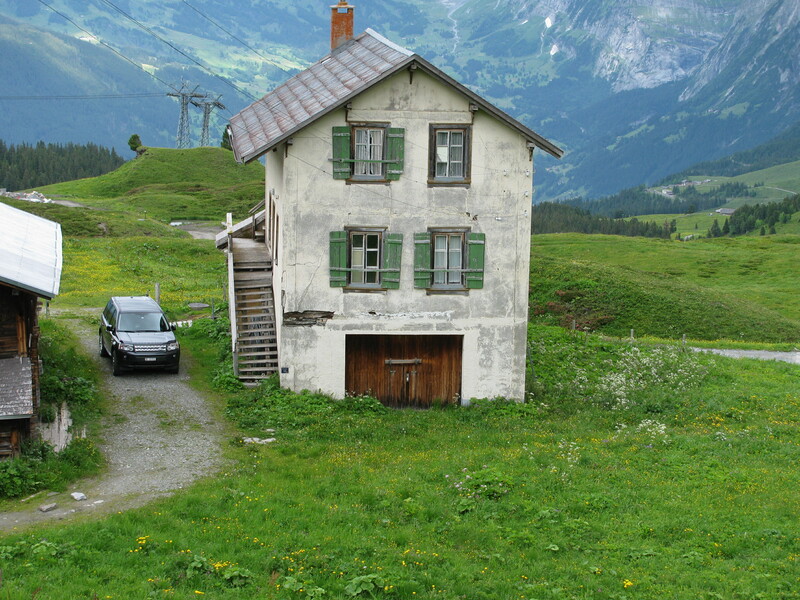 The mountain-clinging village of Murren is full of sturdy-timbered chalets that look exactly as you would expect them to, but this one. This one is a little sloppy compared to the rest. 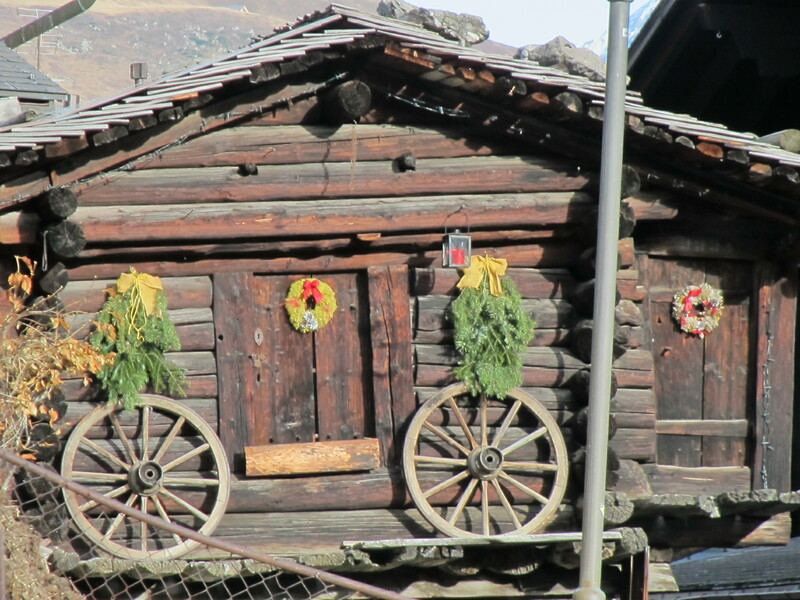 Murren: We think this is a charming way to decorate a ski cabin. 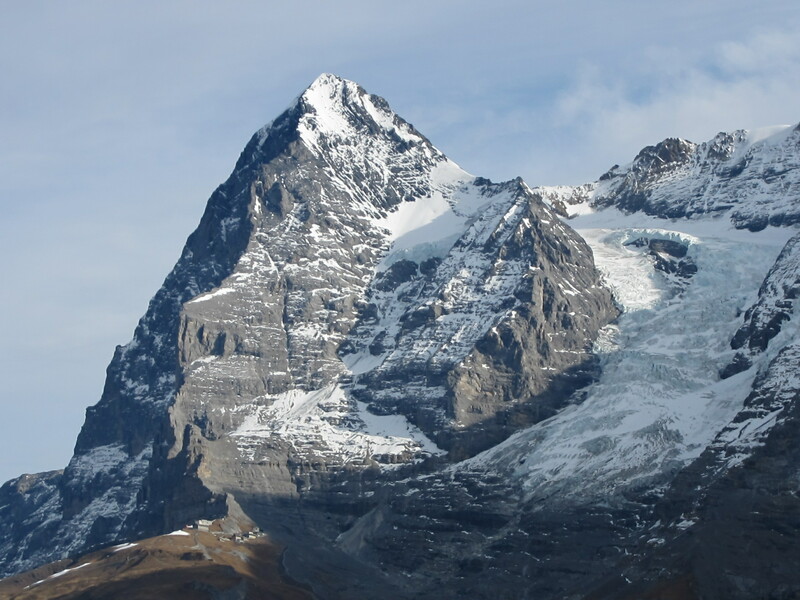 Here is a Swiss mountain. As Bernese Mountain Dogs are my witness, I do not know its name. Sailing at Lac Thun on a beautiful November day. 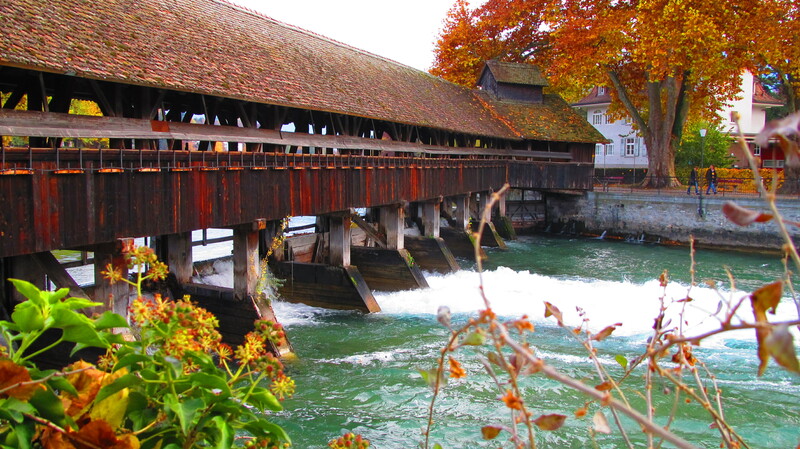 Thun was so pretty that it is worth one more look. Here are some photos from that charming place. A note on crime: We strolled the old-city without any sense that pickpockets were nearby, and even Thun’s train station lacked the menace that other European train stations have with their notoriety for thieves (see Paris blog about the Gare d’Lyon in that fair city by clicking here). 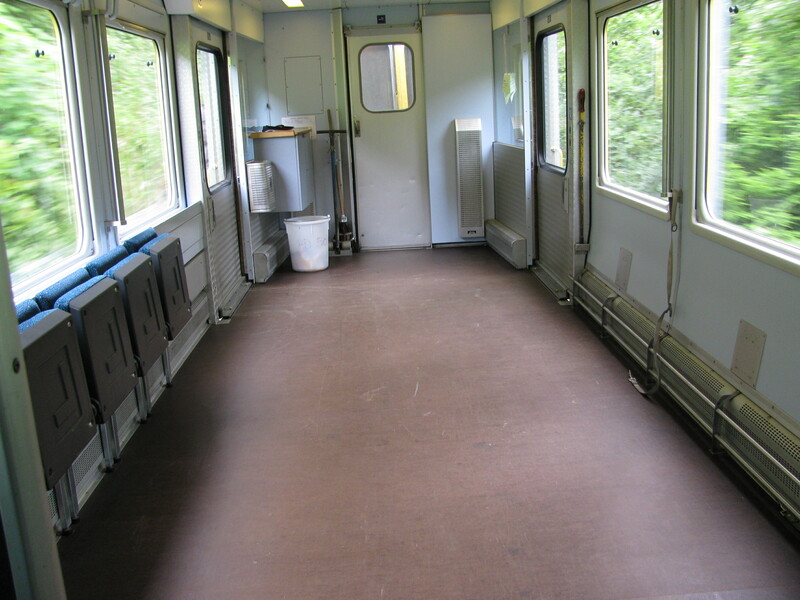 Many Swiss cities have urban injection sites for drug addicts, which reportedly are having some success in helping people out of that lifestyle, but their presence also leads to a whole lot of unpleasantness around many train stations (for some reason the sites are situated near the train stations, probably because the stations are in the city’s core, naturally). 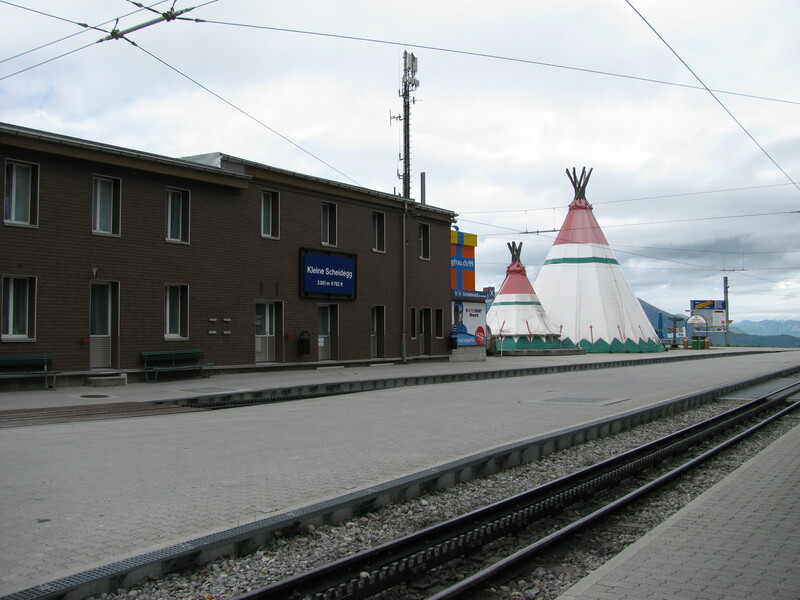 Our little town of Biel/Bienne has an injection site near the train station, making it the most unsavory part of town. It’s too bad because it’s also the first place tourists see when visiting here. Thun didn’t seem to have that drug/drinking population, although we were there on a Saturday. Maybe they took the day off. We have seen our town’s preeminent drunk on the train – perhaps he was on holiday, or merely scouting for new franchise locations. Covered walkway over a river dam at Thun, at the River Aar. 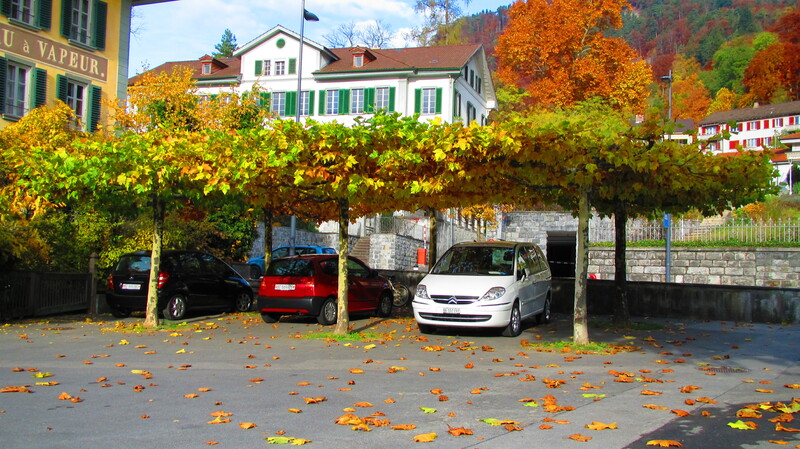 The Swiss even make car parks look pretty. They are a wonderful people. 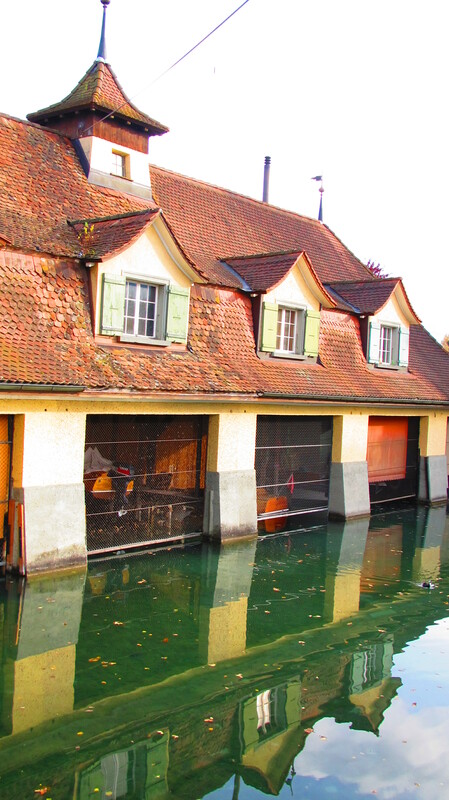 The Swiss idea for a garage along a river. This was off a little creek just a few metres from the River Aar - it was full of wood boats. Lovely. 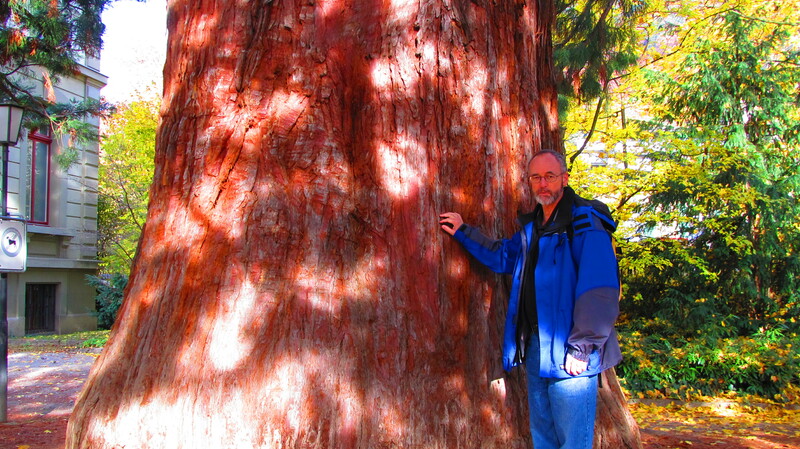 Switzerland is like Victoria, B.C., Canada for its large trees. Holy dynamite, Batman! That's a big one. The top of Europe? Not quite. 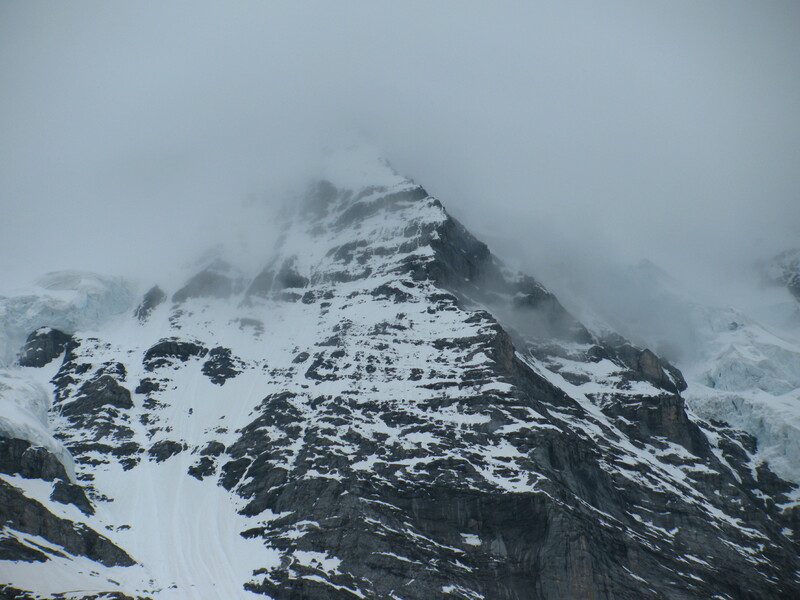 The forecast was for sun, but heavy cloud-cover cancelled our final leg of the journey up to the "top of Europe." 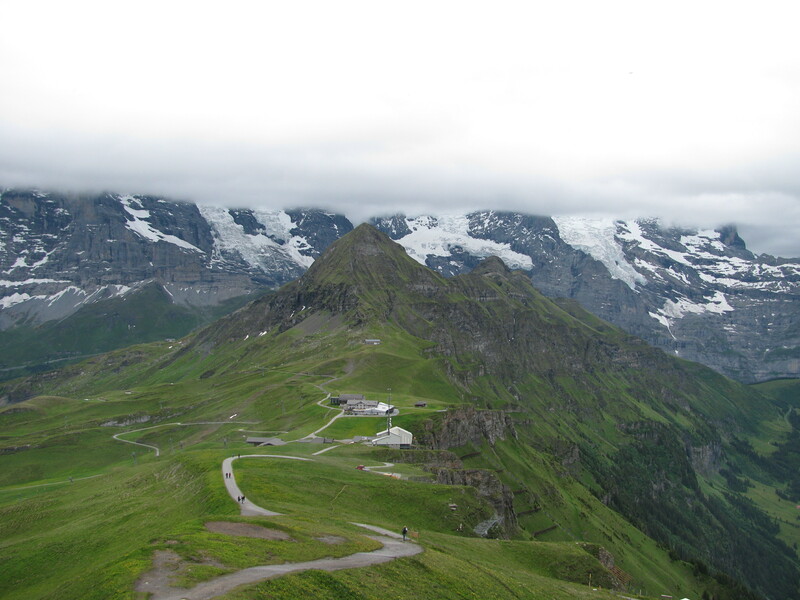 We arrived at the end of the Kleine-Scheidegg trail and discovered the “top of Europe” was obscured in fog. Hand it to the Swiss, they won’t try to sell you a ticket to nowhere. When we queried the ticket agent on whether it was worth taking a chance on the $100 one-hour train trek up to the top, she looked at us as though we had lost our minds. Don’t go, is all she had to say. Actually, she didn’t say “achtung,” but we find her hilarious for the way she speaks politely in English to us and then sternly in German to someone else, such as the time the hotel was a little slow on securing our room’s safe to the wall. When we alerted her that our request had been unheeded for a few days, she gently said, “Oh, I’m sorry. I will take care of it.” Then she picked up the phone and spit a few sharp German words into the receiver. When she was finished, I asked if I should meet the maintenance man up in the room, to which she replied. “He is already there.” And then she sent a translator along to make sure there were no language gaps between me and the maintenance man. Daniela is only 22-years old, but if I were embarking on any business venture, I would hire her in an instant. She is a “get-it-done” kind of gal. 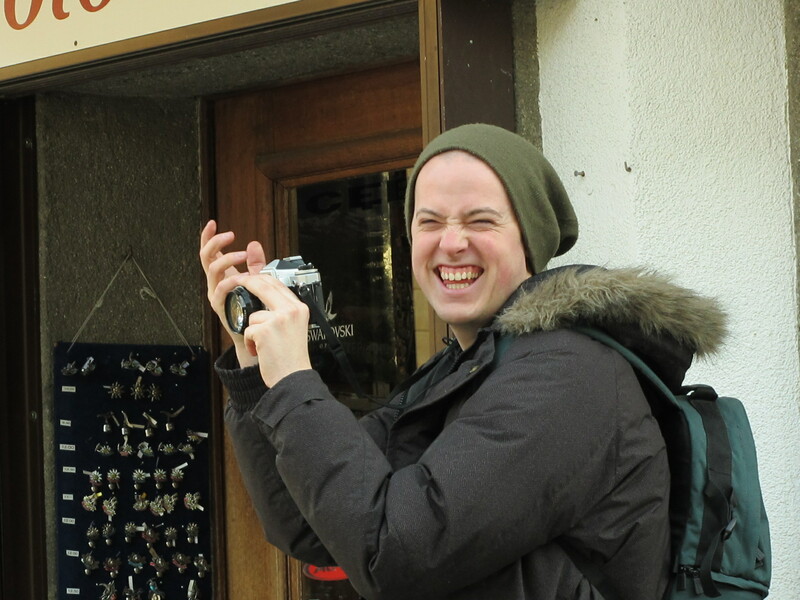 And so, we put off our trip to the “top of Europe,” but we still came back with these lovely photos. 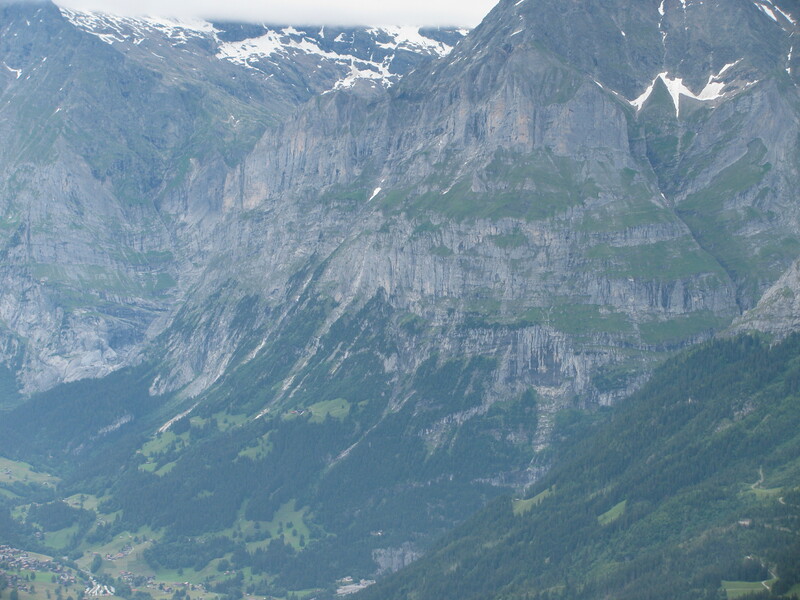 Looking south from Mannlichenbaln toward the Lauterbrunnen valley, which you may notice has nearly perfect vertical walls. It is the site of 10 beautiful waterfalls, as well as the Trummelbach falls, which we hope to visit. 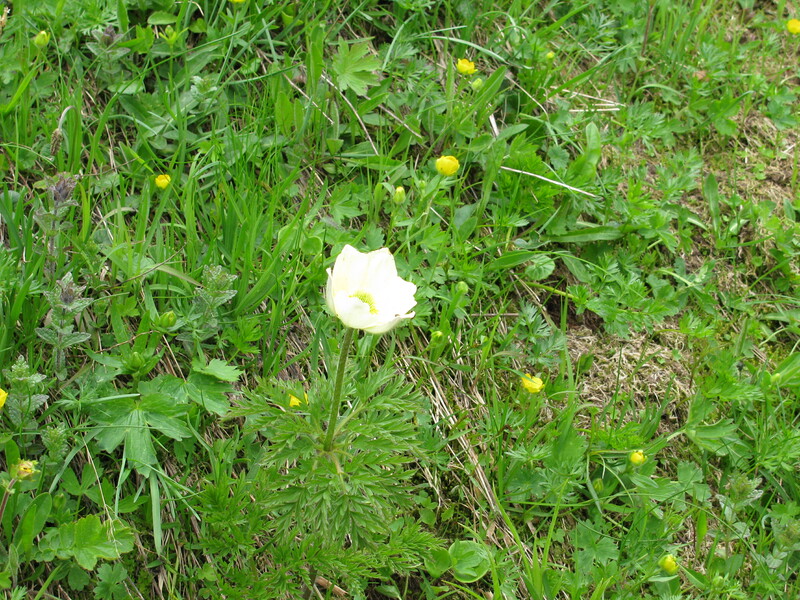 The rare Alpenkuchenschelle flower. I did not make that name up. Another hiker with a flower guide book let me photograph the page identifying this rare blossom. At least, she told me it was rare. The book was in German, so I couldn't verify anything, but she looked honest. 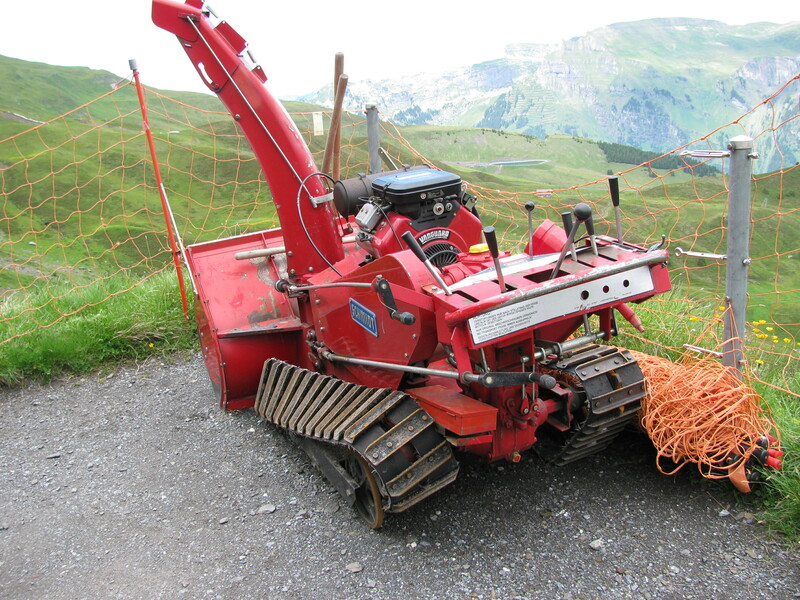 More heavy equipment along the Kleine-Scheidegg trail - this one looks a little worse for wear. What the heck - are the Swiss using the Alps as a backhoe-graveyard? This house needs a new coat of paint, but there's no denying the occupants enjoy a lovely view. 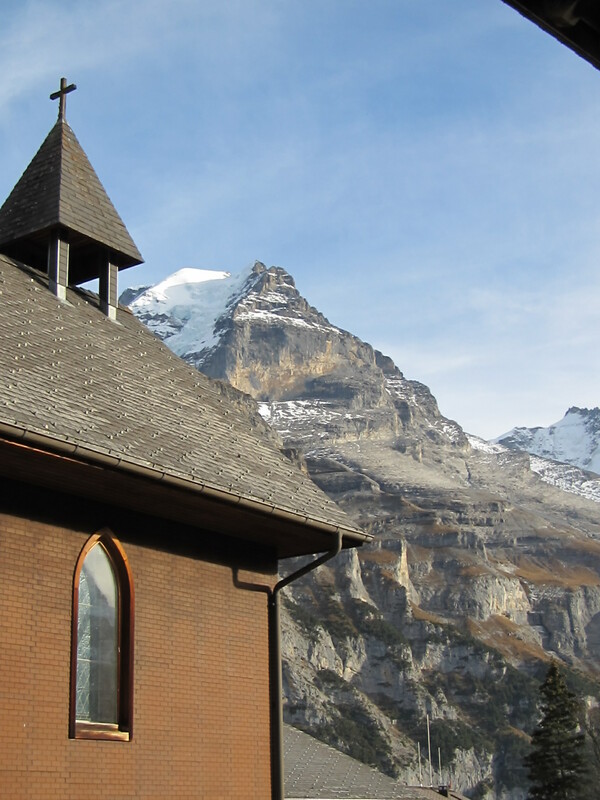 We did not expect to find a Canadian icon at the end of the Kleine-Scheidegg trail. What the heck - teepees! The roof on this mountainside cabin appeared to be made of irregular shale sheets. Good-bye to the Swiss Alps. We hope to visit this region again - there is no end of amazing sights here. 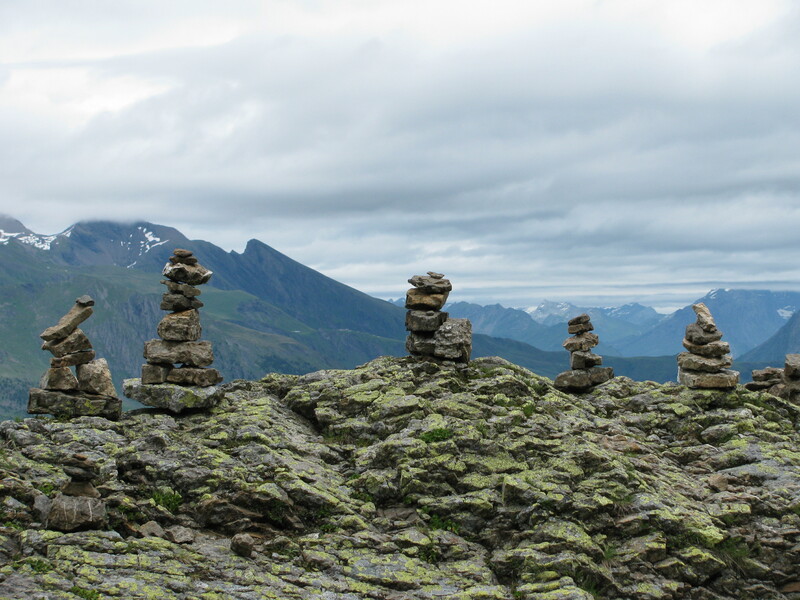 The Swiss version of Inukshuks - a more stream-lined design, lacking in pretension. 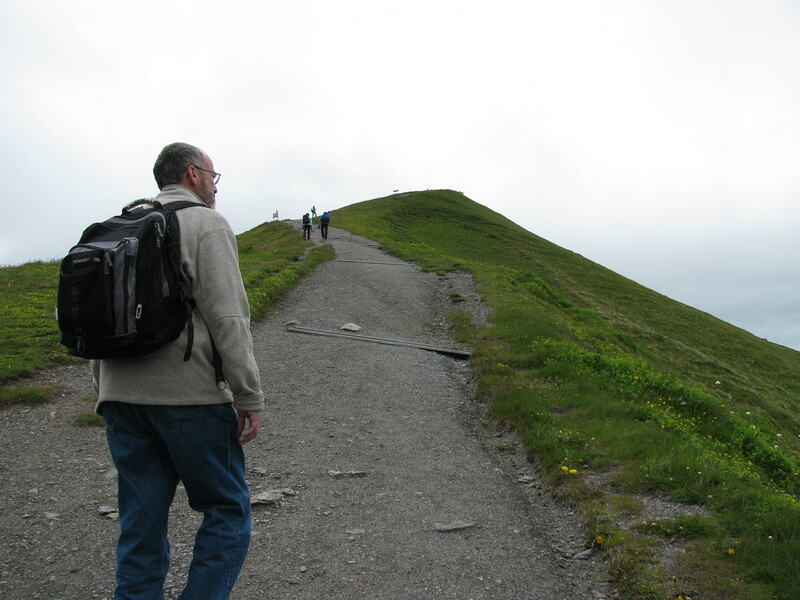 We turned away from the Mannlichenbaln look-out with the satisfaction that came from knowing that the rest of the hike would be a gentle downhill stroll,dropping from 2,342 metres to 2,061 metres over a 4-km (2.5 mile) trail. The problem is that a good piece of that drop appears near the beginning of the journey. I could be wrong about that – the pitch might be only a 30-foot drop over about 50-feet, but as a borderline acrophobe, it looked pretty bad to me. Remember, I’m only five-feet tall – the slightest undulation in the earth’s surface looms larger at my height, or lack thereof. Every time Dave sees an Inukshuk, he threatens to kick it down. 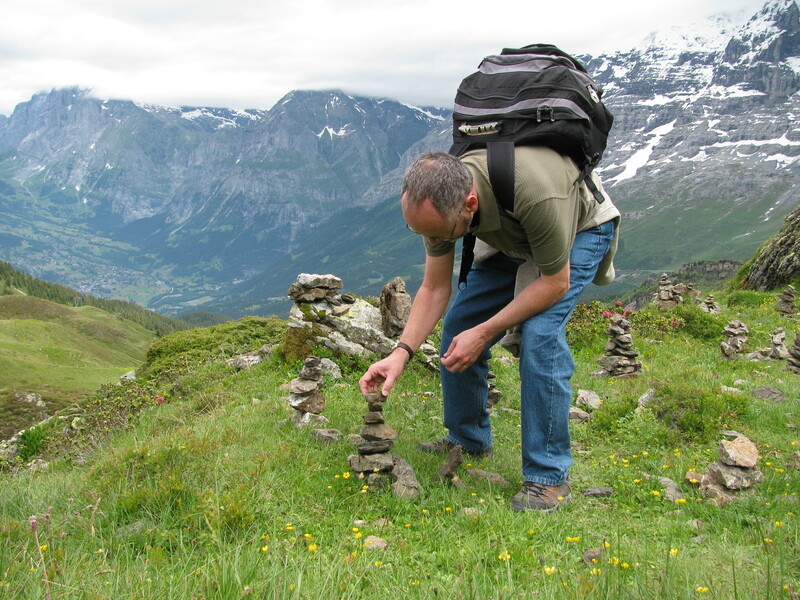 It is his schoolboy playfulness that makes him say that, but as soon as he got within range of a stone-statue field at Kleine-Scheidegg, he started fixing broken statues. What the heck!? Dave quickly covered the worst of it owing to his long legs and impeccable sense of balance. I, meanwhile, scurried down crab-like, sideways with my fingers clenched to the rope bordering the steepest part of the slope. I would have got down on all fours and crawled, but there were Swiss everywhere and I was mindful that they not see me fall to such depths symbolically, even as I feared falling to worse depths literally. 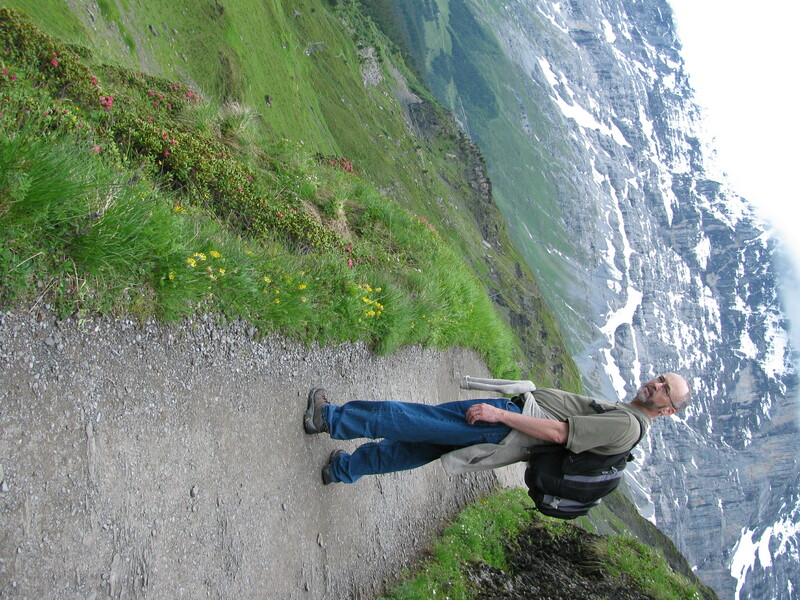 The path gradually tilted back into a reasonably level grade as we headed south. Looking back from the glory of relatively level ground, the pitch did not seem so bad, and I decided to adopt a non-chalant attitude towards this mountain-hiking business. 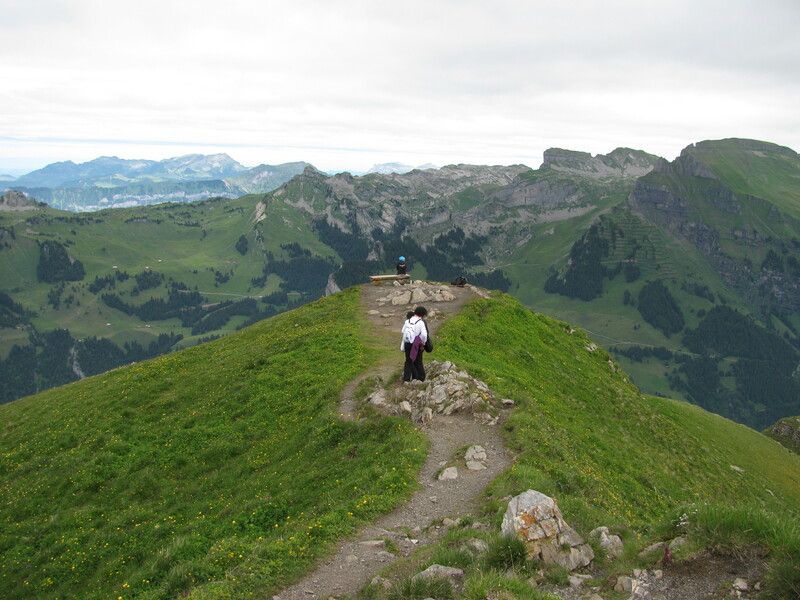 The trail winds along the ridge, without benefit of a single guard rail, which as I pointed out before, is how the Swiss “thin the herd,” and also thumb their noses at safety-conscious Canadians. I am not wrong about Canadians and their national obsession with safety. As a three-term parks commissioner, I had the unfortunate experience of sitting through meetings listening to shrill arguments against accepting a particular piece of oceanfront parkland from a developer because it featured a narrow rock gorge, the very thing that I asserted made it a steal-of-a-deal while other commissioners fretted over how to protect the public from it by installing concrete blocks, high fencing and an abundance of bright yellow signs depicting human figures falling from great heights with a crown of exclamation marks about their heads as they contemplated their surprising and very imminent deaths. To listen to the phobic commissioners, one would such think such a fatality occurred weekly, but there have never been any recorded deaths at that site. I lost that vote, but I am not bitter. 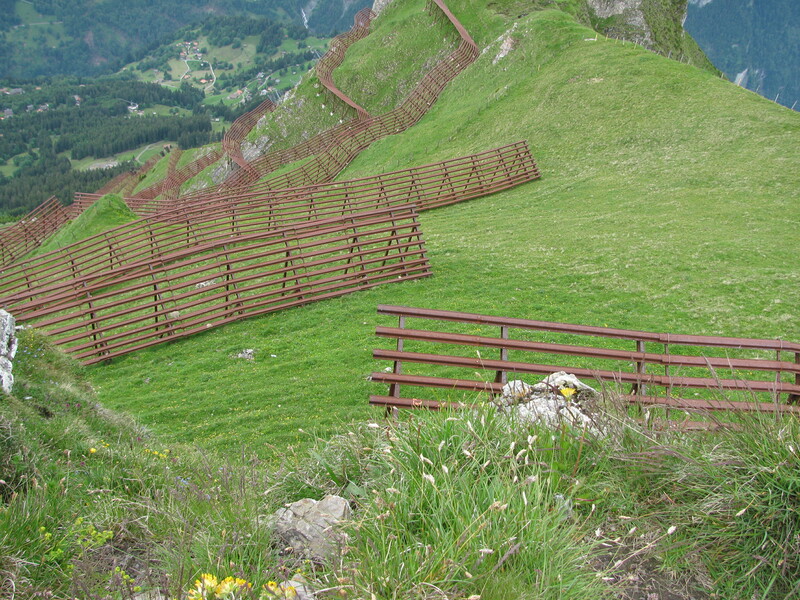 I do wish, however, the Swiss considered guard rails with a more generous eye. The beetle was clearly coming after me! 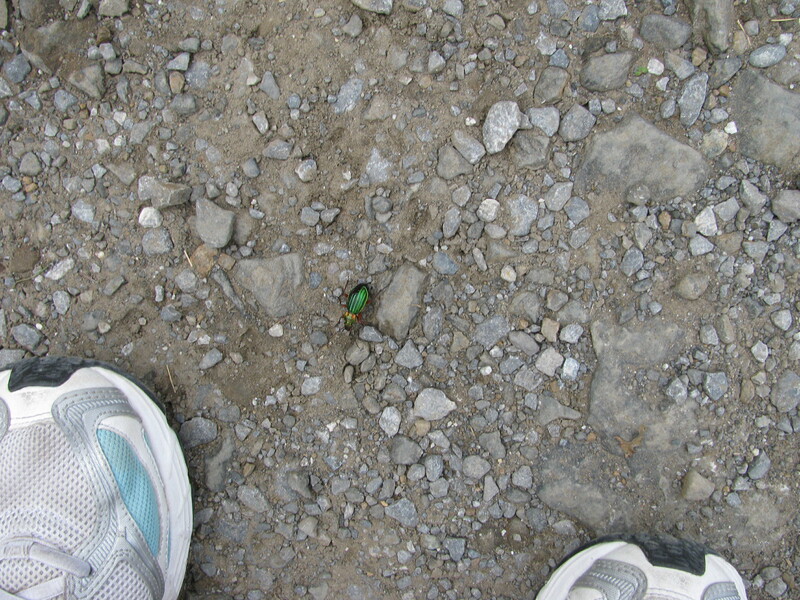 As we made our way along, we spied a sparkly hued beetle picking across the path. As I photographed the beetle, it crept gradually in my direction and so I took a step backwards, then another and still one more. At that point Dave started to twitch and say “Jo!” with an air of urgency. We have raised two boys, one of whom put us on a first-name basis with the emergency room staff at a hospital in a town where we had then lived only eight months, so Dave and I have both developed immunity to airs of urgency, not because we don’t care, but because they are so common and the ensuing trips to the hospital so much a regular and predictable part of our lives. I was unknowingly within a spit of going over the edge, and as is always the case in these matters, things got complicated. An elderly undoubtedly Swiss couple – and I say “undoubtedly” because people of that age from any other nation would wisely stick to golf or some other sport that keeps one within a reasonable proximity of sea level – where was I? Oh, the couple – they were just readying to pass between us, and Dave wasn’t sure if any sudden movements on his part, such as grabbing his wife before she started a new life as a quadriplegic, would cause everyone to flinch and thereby more assuredly send me, and maybe a few others over the edge. He repeated “Jo!” to which I said “What! ?” in irritated tones. I did not see anything to worry about, but then I never do, primarily because I never look where I am going. I leave that to Dave, so you would think I would listen to him. But I don’t. 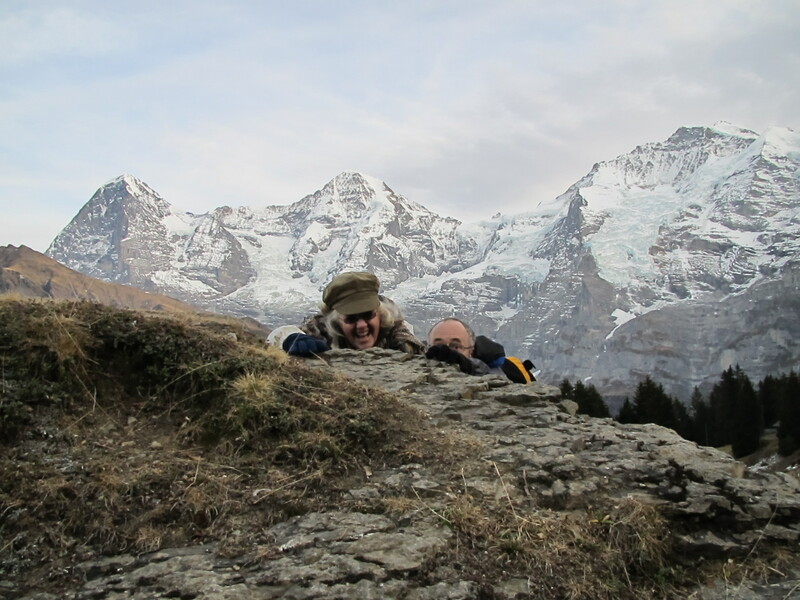 It suddenly occurred to me that we were in the Swiss Alps and that if Dave thought I should stand still, it might be a fine idea, so I stopped and disaster was averted. The Swiss couple passed by, commenting that the beetle was of the Schoenborgh valliagnachtunggesselschaft variety, which I asked them to spell, but they only repeated the name as though its spelling was as self-evident as the spelling for the word wow. I suppose they did not want to embarrass me by treating me like a second-grader incapable of mastering a simple 17-syllable word. 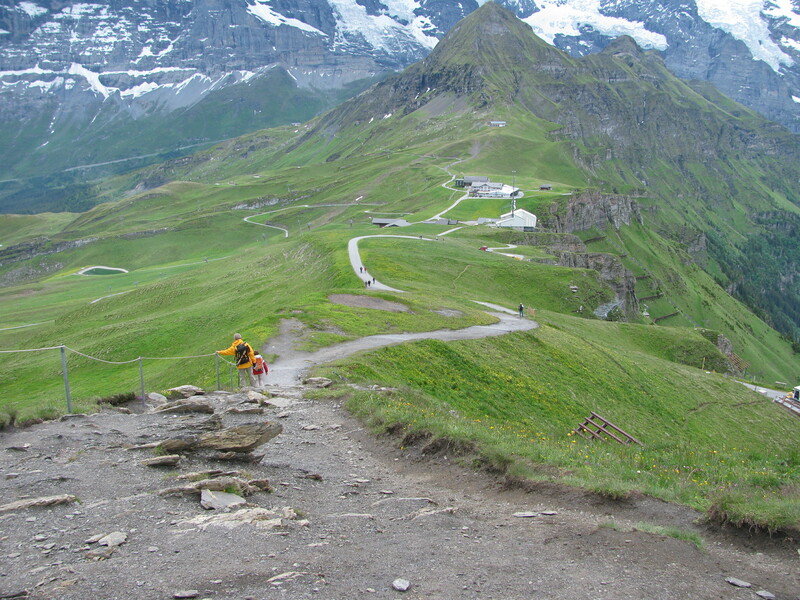 We did not expect to see cyclists up on the Kleine Scheidegg trail, but there they were. We made it to the end of the trail, once having to duck out-of-the-way of speeding cyclists, their presence and velocity suggesting their own ends were nigh. One bump of the wheel and that would be it, although they appeared to be Swiss, and so having attained adulthood, were likely not of the accident-prone variety. 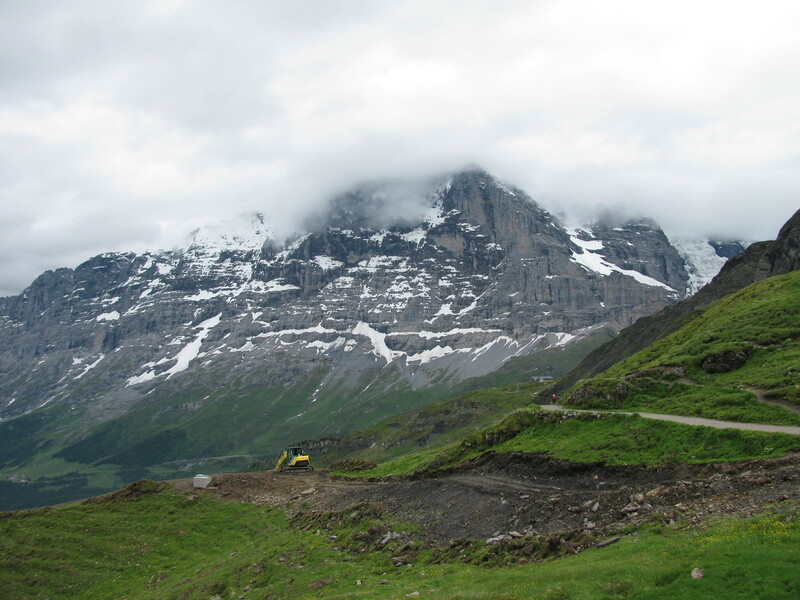 By way of interest, while the Kleine Scheidegg trail is long-famous for its dramatic mountain topography, this has been added to in more recent times as it is the model for the Gran Turismo video race-driving game series. If you go: The trail is mostly level with a well-maintained gravel-and-soil-packed surface that would likely hold well even in wetter seasons. Hiking boots are recommended, but sports shoes are okay. Going at a relaxed pace owing to my burned-out achilles tendons, we covered the 2.5-mile trail in 73 minutes. 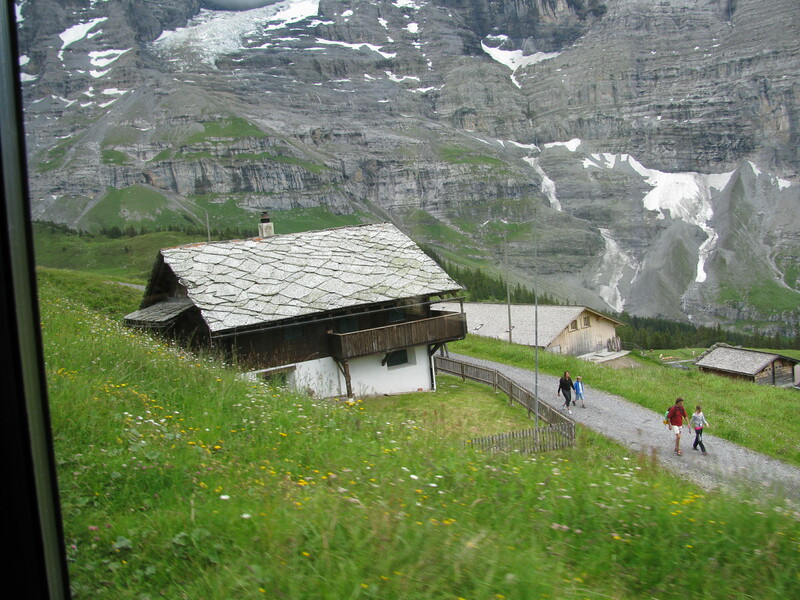 Food & Water: Eateries are plentiful at the base of the gondola leading up to the Kleine-Scheidegg trail, however, stopping in at the local grocer “Coop” to purchase a submarine sandwich and a bottled beverage is recommended, particularly if you choose to hike the trail in the hotter season. 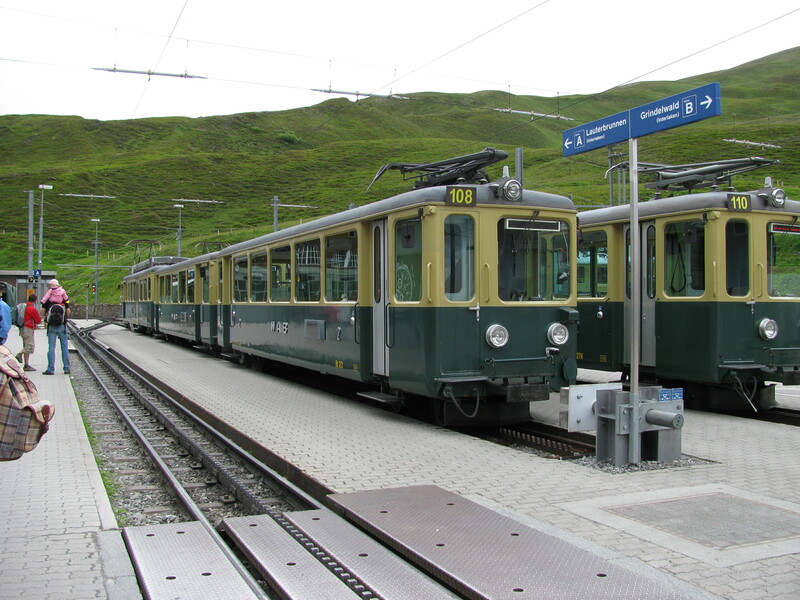 Cafeteria-style food is available at the end of the Kleine-Scheidegg end of the trail, but not at the Mannlichenbaln gondola station. 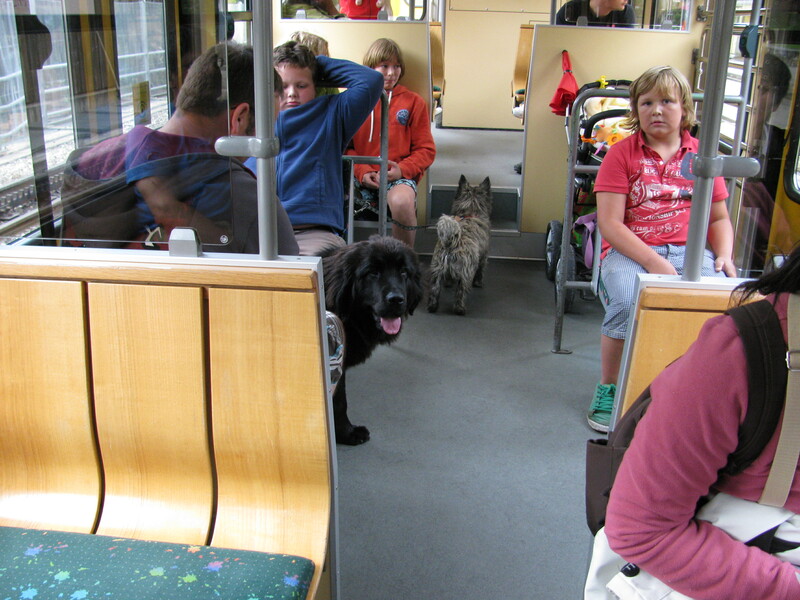 Tomorrow: More photos from the Kleine-Scheidegg trail and the cogwheel train trip down the mountain. Dave does not trust me near steep drops. Yes, he is right to not trust me. 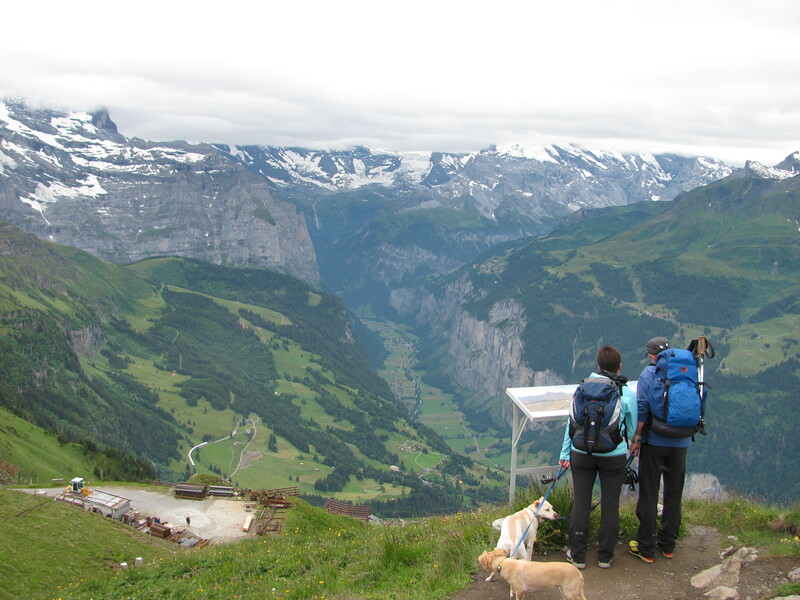 The view from Mannlichenbaln looking south toward the Jungfrau mountain range. Stepping off the gondola that runs from Wengen to Mannlichen, one turns right and is immediately confronted with doors to washrooms. This is a pleasant surprise and likely a necessity for anyone suffering an intestinal reaction to the gondola’s final bump and sway before docking. 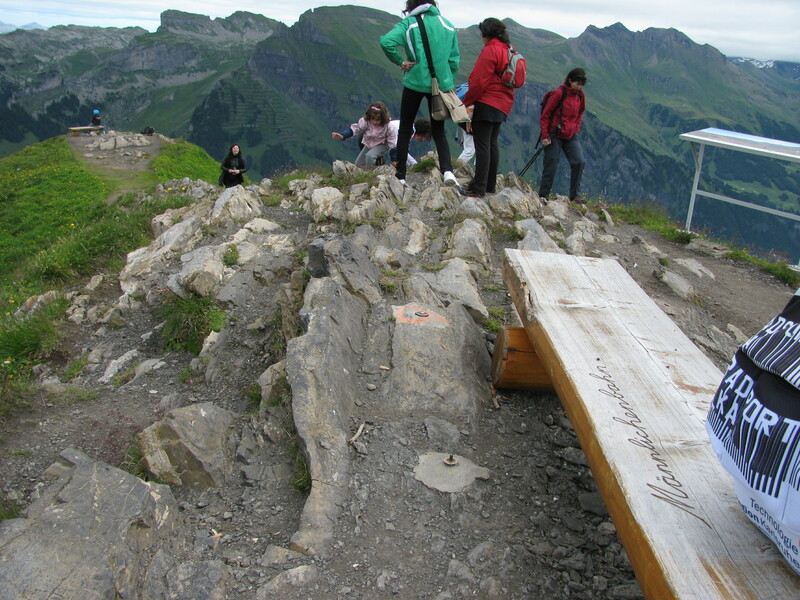 A chunky wooden bench outside the station allows visitors a moment to pause and reflect on the heights they have attained. How high were we? We were looking down on Murren, where we had lunched weeks ago, and at 1,660 metres, we then thought that was pretty darn high. Mannlichen’s upper station is at 2,230 metres, and from this vantage point, Murren looks like a pretty play village of the sort that can be purchased to accompany miniature train sets. Appearances are deceiving. A wide mostly even surface makes it look easy, but this trail is at a rather steep pitch. The air thins out here, which is unfortunate, because a steep uphill climb to Mannlichenbaln still waits for those intrigued by a nearby look-out and if ever there was a need for oxygen, this is it. Here is an important note for travelers making decisions under the guidance of Rick Steves, our favorite travel guru. Steves’ guidebook says the walk is 10 minutes, which sounds like a breezy lark, but it’s closer to 20. Now 20 minutes still comes across as a brief stroll that is worth the price of seeing the Unesco-marked site at the top, but it is a steep climb, made all the more tricky by the fact that it appears to be a friendly gravel road. Do not be fooled. This is no mountain back lane. As we made our way slowly up the mountain, I thought of important things I had left behind at the hotel, things like steroid inhalers, Aspirin and nitroglycerin, all handy in the event of a heart stoppage – mine or some fellow hikers. Of course, while I cautiously paid heed to internal signs of protest from my heart, I watched with great annoyance as chunky elderly Swiss with those cursed walking poles strode about. 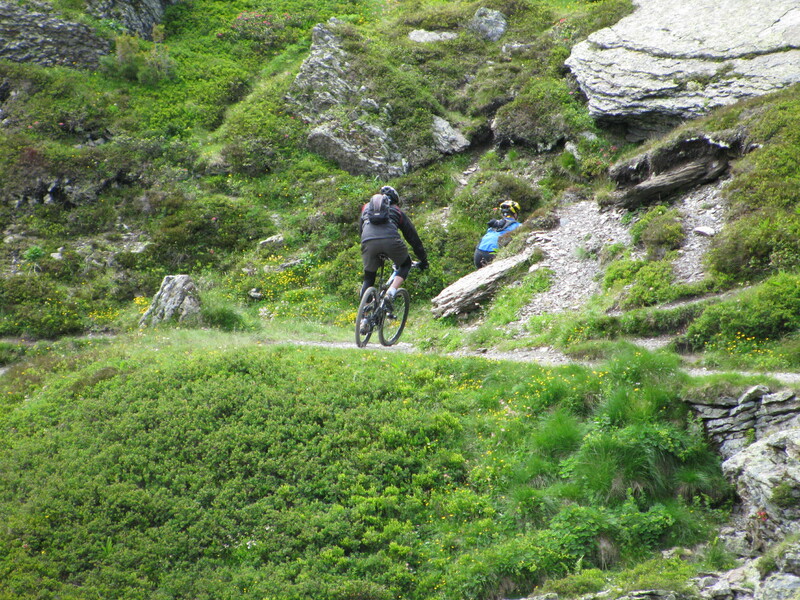 They are everywhere, vigorous, mountain-climbing, cross-country-bike-riding, cheerful Swiss. How they sicken us all with envy. 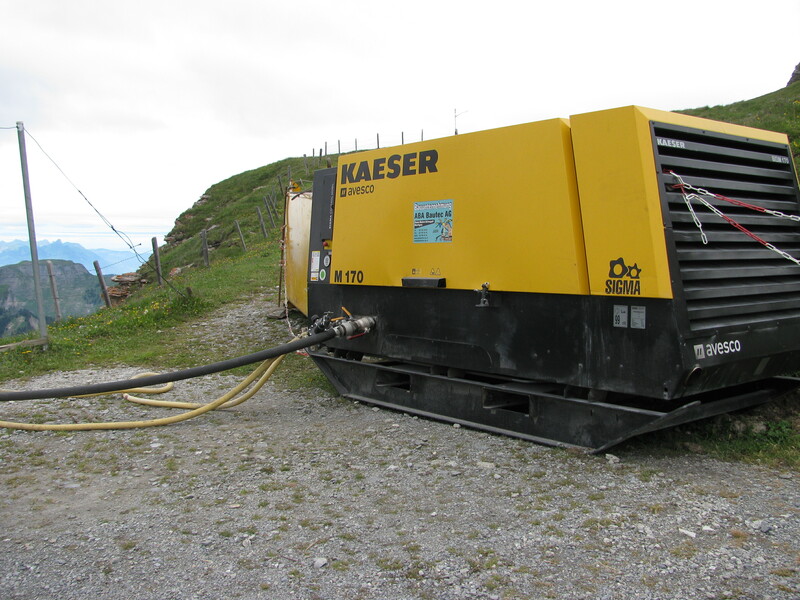 We could discern no actual use for this piece of equipment except to signal that the Swiss have no problem plunking heavy equipment anywhere, even on mountainsides. While en route, we came upon a loud piece of heavy equipment strung with hoses – we peered over the edge to see what the contraption could possibly be siphoning or pumping out from such heights where there were no signs of any buildings, but the hoses disappeared down the slope. The only hint of its function was a lingering septic aroma wafting in with the mountain air. 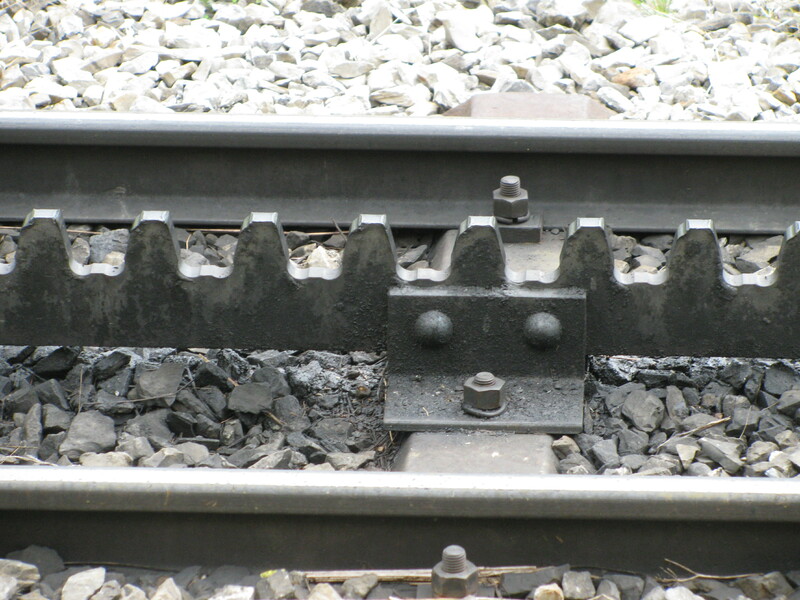 With no machine-operator in sight to explain this, we shrugged and continued the near-death march up the mountain. If you stumble, these will stop your fall. Note: The challenges of capturing perspective on camera means that this slope is much steeper than it appears. Yes, as much as the fall will hurt, the landing will be worse, but still better than going the whole 2,300 metres down to the valley floor. 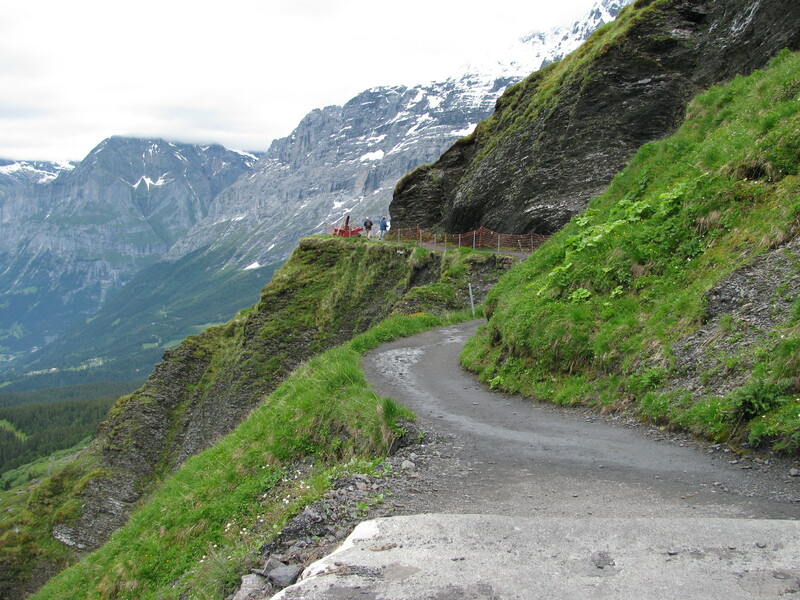 The final 40-60 feet of the climb is over uneven rock so the Swiss have fashioned a few metal poles strung together with rough rope for visitors to grasp for safety. Those fearful of plummeting need not fret – they will soon be caught in the teeth of steel snow-stoppers that flank the mountainside like the brims of stacked hats, and so the fall will be brief, but likely still fatal and certainly extremely painful. 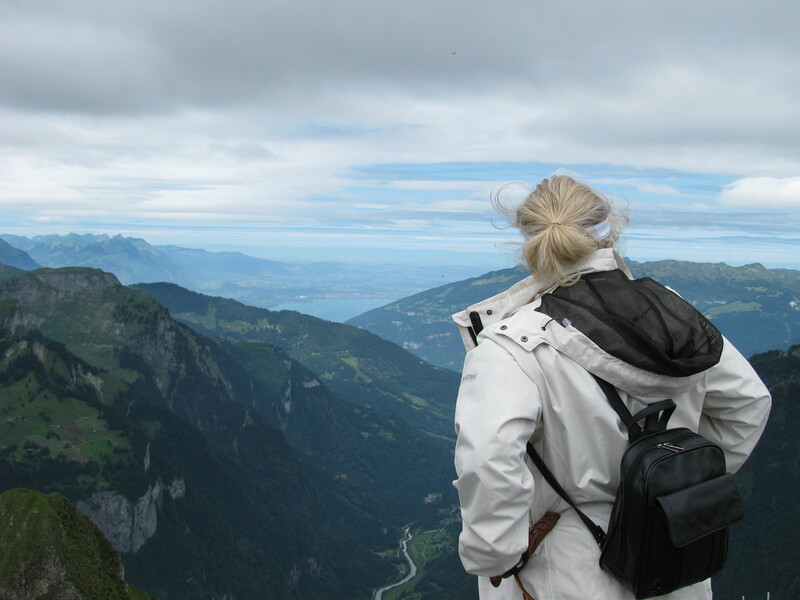 At 2,342.6 metres, we rounded the top and were treated to a lovely 360-degree view stretching all the way to the waters of Brienzersee and the Lauterbrunnen Valley. This is not the top, of course. 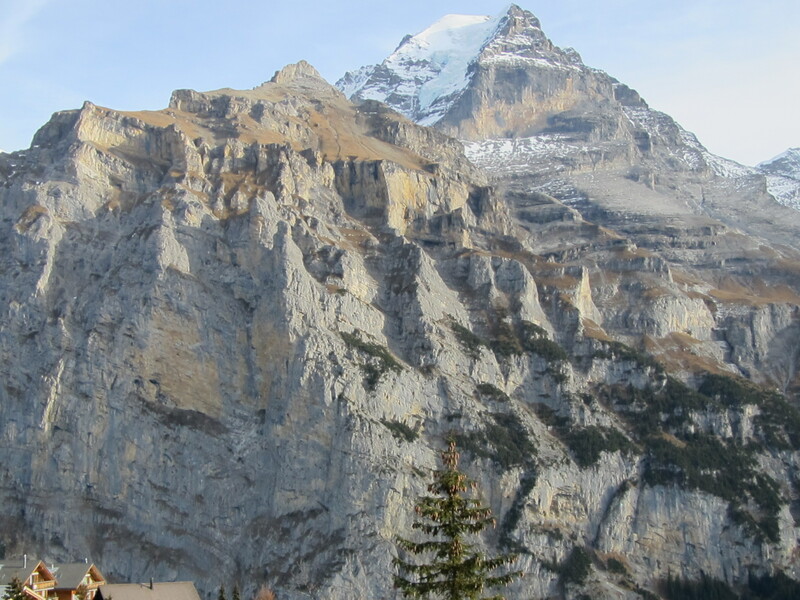 The enormous mountain peaks of Jungfrau, Jungfrauloch, Monck, Eiger and Schreckhorn still towered beyond. 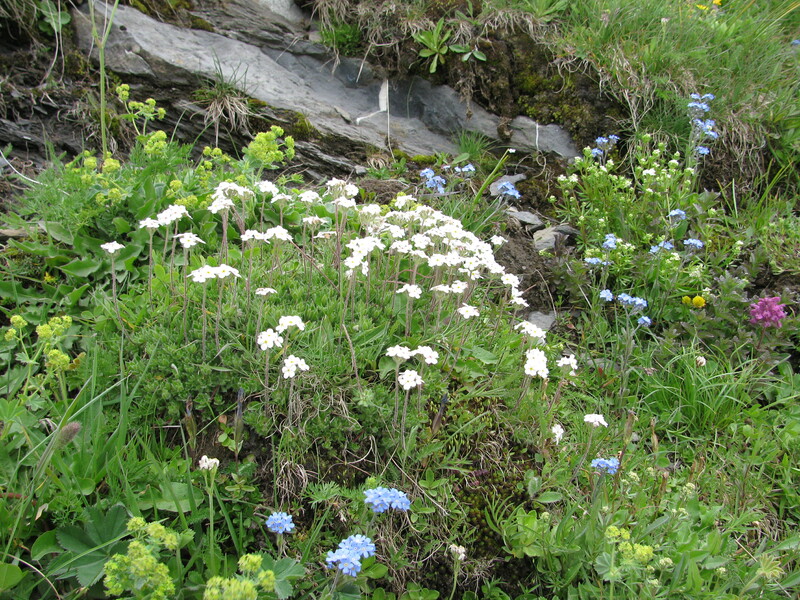 Tomorrow: The Mannlichen-Kleine Scheidegg trail. Looking north toward Lake Brien or also known as Brienzersee. At the look-out - benches, another trail to another look-out, not a single safety fence in sight. This is not Canada. If you fall off, it is no one's fault but your own. The Swiss say: You knew they were mountains, right?